The United States men's national soccer team found World Cup redemption Monday, defeating Ghana, who knocked them out of the 2006 and 2010 tournaments. Goalkeeper Tim Howard believed it would happen and even went to Twitter hours before to tell the world. Even when Ghana fired a goal past him in the 82nd minute to even the score at 1-1, Howard refused to let the setback sink him, and rallied his defense. 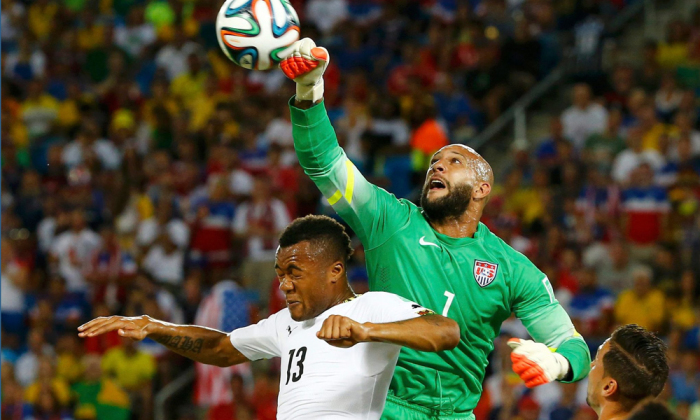 Then John Brooks scored his winning goal, and Howard's belief came to fruition. Howard stands alone as the last line of the U.S. defense, and he shoulders the burdens and scrutiny of the position. To succeed, Howard depends on his own anchor, his faith in Jesus. "The most important thing in my life is Christ," Howard told a youth group he volunteers with. "He's more important to me than winning or losing or whether I'm playing or not. Everything else is just a bonus." "Nana's sense of peace was so powerful because it came from her faith in the Lord. Through her, God revealed His love for me as well. It wasn't long before I was following in her footsteps. I wanted the same kind of faith and peace she had, and that is exactly what God gave me." "Today, I am blessed to be living a dream. And yet, if it all went away tomorrow, I know I would still have peace. That probably sounds crazy to most people, but that's the kind of peace Christ gives. It is rooted in His love, and it surpasses all understanding." Watch Tim Howard talk about the most important decision of his life.